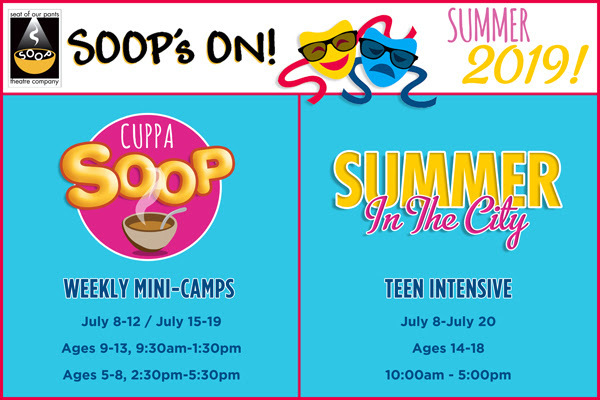 SOOP kicks off the launch of our SUMMER / 2019 Programs with a GO FUND ME Campaign! This Exciting New Program will be happening on two fronts! Our weekly “mini-camps” for kids ages 5-8 and 9-13, will take place in Pelham, NY (location TBD) and will run like a “half day” camp program in weekly increments from July 8 – July 19. Our “teen intensive” program will take our more seasoned students into NYC for a 14 day immersion, culminating with a performance of an original musical in an Off-Off Broadway house on the final weekend! There is an exciting project being considered by an up and coming composer/lyricist, so stay tuned for the details! But this can’t happen without your help! Click on the button below to see how your contribution will make a difference! Don’t forget to check out all of our wonderful “HUGS” available at all the various levels of commitment – our small way of saying Thank You for your generous and continued support of what we do!